Use the !develop command from the agent console to reveal helpful debug tools on the visitor’s chatbox. This is useful for debugging. We’ll do our best to help with any questions you have. The API is intended to be self-serve for web developers, so we’re not able to write or debug your own code. You can translate the chat box into any language in your text settings and editing the text. If you need to work with multiple languages, use our API to localize language strings. Enables the Attention Grabber slide-out animation. If you’d like to reach out to people on your checkout page to ensure you make the sale, or offer a discount, you might wish to animate the Attention Grabber on that page only, to give it extra prominence. Alternatively, should you enable the slide out action on the Attention Grabber settings page, you can disable this animation per page by switching the true to false in the example above. Set the Attention Grabber image height in pixels. Results in an attention grabber with a height of 25px. This only works if you either, have the Attention Grabber switched on in the Attention Grabber settings, or are using the API call to Enable the Attention Grabber. Set the Attention Grabber image width in pixels. Results in an attention grabber with a width of 100px. You can enable the Attention Grabber on a page by page basis using this API call. If you’d like to reach out to people on your checkout page to ensure you make the sale, or offer a discount, you might wish to show the Attention Grabber on that page only. Sets the Attention Grabber image while all your operators are set to away or offline. This call would be useful if you wanted a different image on a particular page, such as the contact page, or if you only wanted the Attention Grabber to appear on one page. Sets the Attention Grabber image while your operators are set to available. Change the position of the chatbox. This can also be changed site wide from the Theme Settings Page. Change the size of the chatbox. 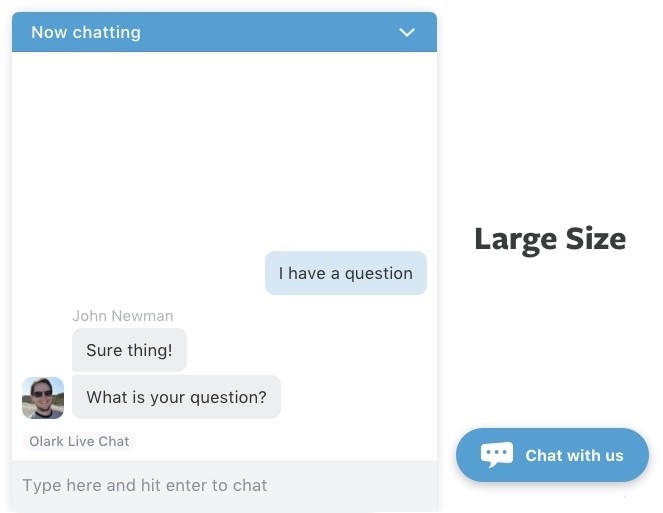 The chatbox can be configured to appear in one of three different sizes: small, medium, or large. By default, it uses the medium size. Changing the size of the chatbox will also modify the size of the chat button. You can also configure the chatbox to take up the full height of the web page and slide in from the side as opposed to the bottom, like a “side drawer”. This configuration uses medium size defaults. Choose what font you’d like the chatbox to have. Use this call with an Array of valid loaded fonts. Note that the fonts must be loaded on your site for the chatbox to be able to use them. Change the text position for right to left language support. This can also be changed site wide from the Theme Settings Page. We have two options that allow you to have ‘soft’ or ‘hard’ corners for the chatbox. By default the chatbox will have soft corners. Change the color of your visitor messages. This configuration key will only accept hex values. Disable the mobile chatbox. This can also be changed site wide from the Theme Settings Page. Normally, the chatbox is anchored to the bottom of the webpage. This detaches the chatbox from the bottom of the page, allowing it to float near the bottom instead. 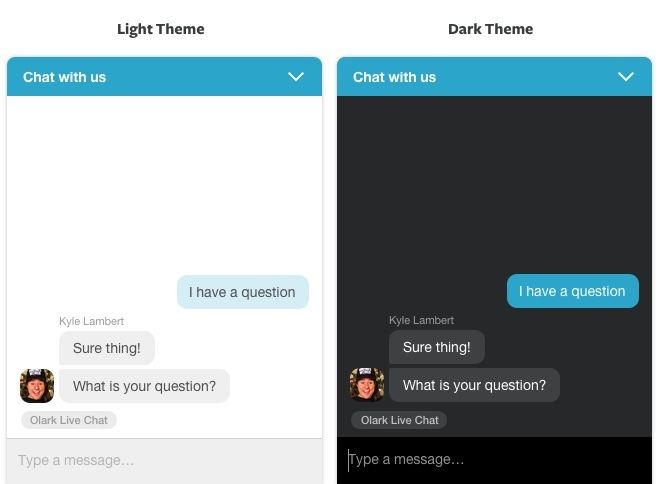 Choose a light or dark theme for the chatbox. This can also be changed site wide from the Theme Settings Page. You can enable a dark theme on a specific page. You can also do this for your entire site from the Theme Settings Page. 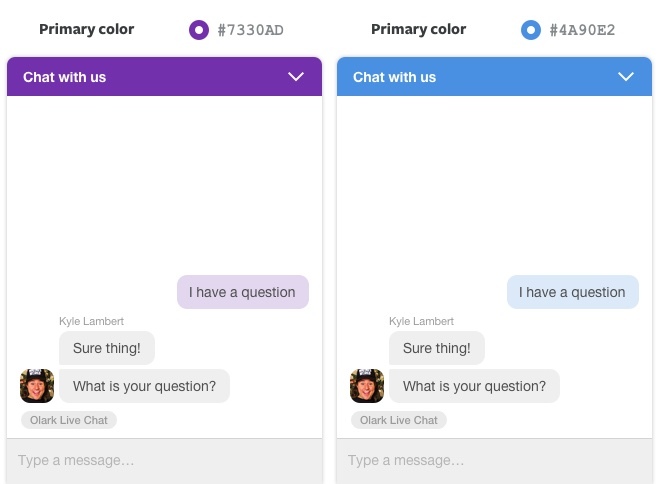 Set the primary color of the chatbox. This can also be changed site wide from the Theme Settings Page. Show the button text on the chatbox icon. This can also be changed site wide from the Theme Settings Page. Show the chatbox as a tab. This can also be changed site wide from the Theme Settings Page. You can dynamically change the chatbox language after the page has loaded. By using this call the default localization strings provided by Olark will be used and will override any text you have set in the Text & Forms dashboard. This call, however, will not override any language configuration calls like olark.configure('locale.welcome_title', 'Foo'), the string provided by that call always takes highest priority. You can see a list of languages we support here. Expands the chatbox to its fully expanded height. It will also show the chatbox if not already visible, in the same way as api.box.show. 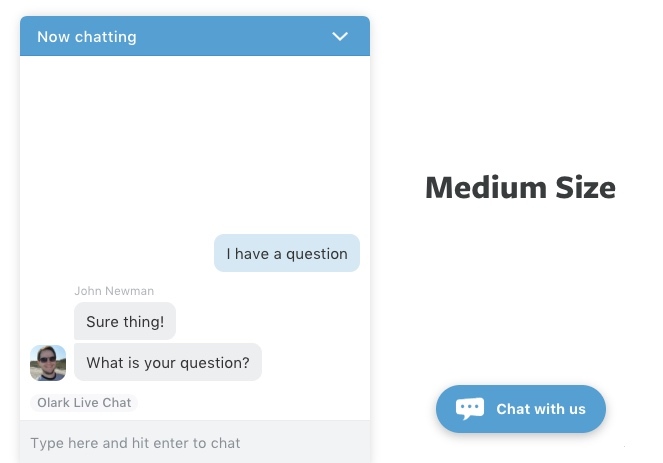 Using this API call overrides any existing Targeted Chat rules that may hide the chatbox. 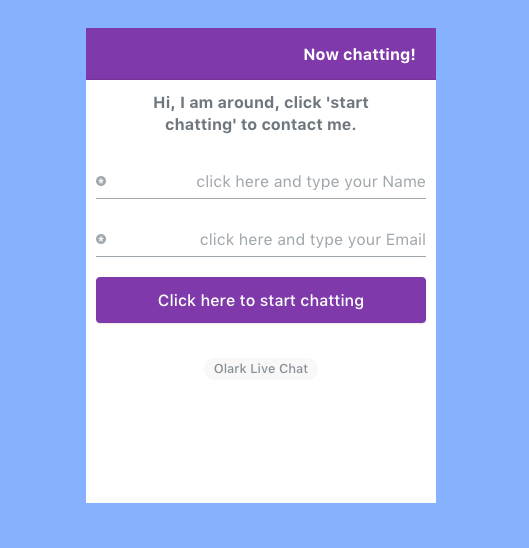 We have a more detailed click-to-chat tutorial in our help section, including an example of a CSS-only implementation. Hides the chatbox. This box will make the chatbox disappear on the page, but operators will still be able to see visitors in their visitor list. 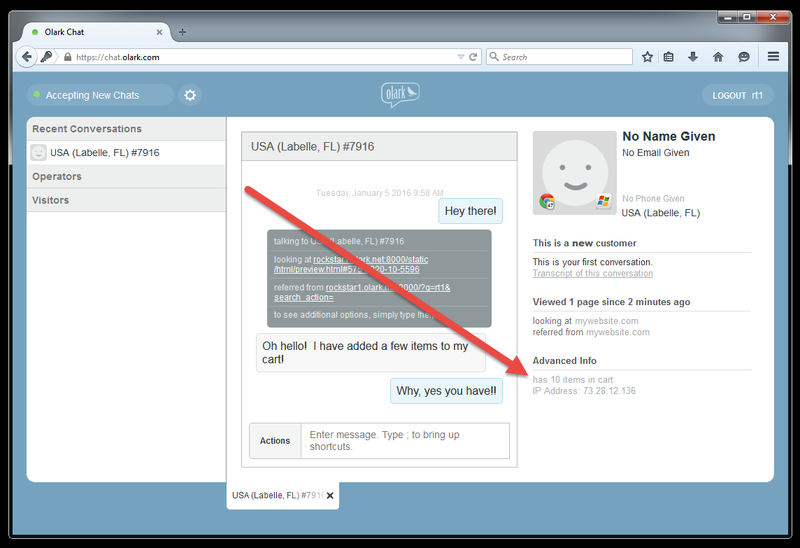 You can also use our Targeted Chat tool to hide the widget, without altering the code of your website. Minimizes the chatbox. Opposite of api.box.expand. Whenever the chatbox is expanded, the given callback function will be triggered. A visitor to your site might expand the chatbox, but not initiate a conversation. You can check to see if a conversation has started and if not, send the visitor a message after 3 seconds. body: "Let me know if you have any questions." If you are trying to track when visitors interact with the Olark widget, to perhaps test out different methods of presenting the widget, you can use this following example to do so. Whenever the chatbox is hidden, the given callback function will be triggered. // Notifies the operator. The visitor does not see this. You could just as easily replace the onHide call, to be onShrink if you wanted to report to the operator when the visitors minimizes the chat widget. Whenever the chatbox becomes minimized, the given callback function will be triggered. If you are trying to track when visitors shrink the Olark widget, to perhaps track via analytics the efficacy of different auto-messaging rules, you can use this following example to do so. Whenever the chatbox is shown (unhidden), the given callback function will be triggered. Shows the chatbox. Showing the chatbox will make it appear on the page. This will override settings such as Invisible Olark. Should you wish to show the widget on specific pages, you can also create these rules using our Targeted Chat tool, instead of updating the code on your page. Note: This method requires a plan that supports the Groups feature. Locks the visitor to a specific group of operators. All messages from the visitor will now go to that group of operators instead of all operators. See the operator configuration page to find the Group ID. When the visitor clicks the Talk to our Sales Team button, lock to the Sales Group specifically. This example assumes that the Sales Group ID is ‘abcdef123456’. You can find the Group ID on the operator configuration page. This is a special rule that notifies a backup group of operators when a customer initiates a conversation but doesn’t receive a response within a minute. Note: This script may not work well without routing to ALL operators enabled in the Setup page. body: "Visitor has been waiting more than 60 seconds"
body: "Sorry, we have just gone offline. We'll be back soon. In the meantime, why not check out our <a href="https://olark.com/help>Help Center</a>?" Use this API call to detect when the Olark chatbox has loaded. You can create your own callback function once the onReady event fires. For example, you would use onReady if you need to manipulate elements on your page only when you know for sure that Olark has loaded. 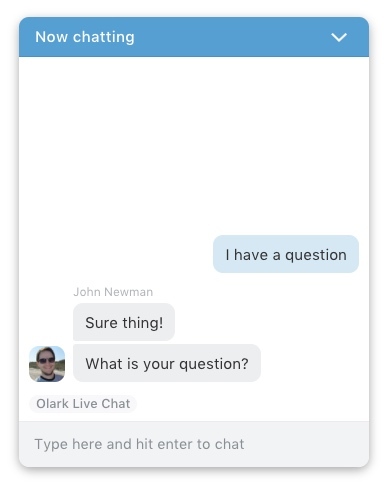 You might be doing an A/B test for live chat, and want to send an event to your analytics when Olark has loaded on a page. Whenever a visitor or operator sends the first message, the given callback function will be triggered. body: "This is a premium customer"
body: "Sorry! I'm a little busy at the moment but will get back with you soon." Whenever a message is sent to the operator, this will call the given callback with an event object. If these statistics sounds cool to you, you should probably try enabling our Google Analytics plugin for a more in-depth integration with Google Analytics. Whenever a message is sent to the visitor, this will call the given callback with an event object. If these statistics sounds cool to you, you should probably try enabling our Google Analytics for a more in-depth integration with Google Analytics. Whenever a command is sent from the visitor, e.g. !track this is a lead, this will call the given callback with an event object. Commands must begin with an exclamation point ! and come at the start of a message. You can also see a list of the default operator commands in our help section. To see these while chatting, type !help into a chat at any time to see the list of commands you can perform. Your visitors will not see the command unless specified. body: "Let me point you to our FAQ page"
Create a custom command to notify a new chatter that there is a queue. By using !q and adding an integer, such as 2 after it, !q 2, you add a custom time into the message. This example tells the visitor that the operator will be with them in 2 minutes. If the operator entered !q 3, it would say 3 minutes. This example also tells the operator what has been sent. body: "Hi there, chat is really busy, I'll be with you in " + (event.command.body) + " minutes"
body: "Telling customer you will be with them in " + (event.command.body) + " minutes"
Whenever any operator comes online, the given callback will be triggered. Here is an example of what it might look like with a little styling. In this example, we also added selectors to change the text as well as the color. Please note: This call will only fire if an operator’s state changes. It cannot be queried. Whenever all operators are offline, the given callback will be triggered. Send a message to the visitor. It will appear as if the message came from an operator. Send a notification message to the operator. The operator will see [info] to indicate that this message was not sent from the visitor. Send a notification message to the visitor. The message will look like a notification, and will not show up as coming from a particular operator. body: "the operator just stepped out for a moment"
Set which domains the chatbox will be displayed on. If your website spans multiple domains’ subdomains, you can choose which subdomains will work. Note that chats cannot continue across top-level domains. In order for chats to go from a top-level domain to a subdomain, the top-level domain cannot be a naked domain (i.e. the URL should be http://www.example.com, not http://example.com). Use * as a wildcard. Separate multiple domains with commas, e.g. *.yourdomain.com,*.yourotherdomain.com. You can also add subdomains on your Setup page page. You can change the language of the chatbox per page by using the following configuration call. If you want to change the language of the chatbox site wide you can do so from your Text & Forms settings. We support the following languages. With calls like olark.configure('locale.welcome_title', 'Foo'), the string provided by that call will always take highest priority. Enable the post-chat survey on a specific page. You can also enable this on the Chat Ratings settings page. You can enable the Pre-chat Survey feature on a specific page. This can also be done on your Text & Forms settings page. You can read more about using the Pre-chat Survey in our help section. Expand the chatbox by default when the page loads. Note that when the chatbox is expanded, Attention Grabber images are hidden. Also, sending a message will automatically expand the chatbox in all cases by default. Normally the chatbox shows an icon in the top right corner that, when clicked, allows the user to minimize it. This configuration option allows you to remove that button so that, once the chatbox has been expanded, the user can not manually minimize it. However, the chatbox can still be minimized and expanded with api calls. Instead of having the Olark chat window fixed to the bottom corner of your page, Olark will instead search your page for an element with the ID olark-box-container and load the chatbox there instead. For example, you might have a <div> in your sidebar that displays the chatbox. This rudimentary example shows the chatbox inside a wrapper, with a header. Gives notifications about what page the visitor is on. By default, each time a visitor navigates to a new URL while on your site, this will be sent as a notification to your operator. Set to false to disable this behavior. This will turn off all of the initial pre-chat notifications that give you visitor context - including location, current URL and number of previous conversations - allowing you to show just your own custom pre-chat information instead. If you have a link in your chatbox that goes to a non-local URL, for example a page on another domain, Olark will by default wrap the new page. This means that the chatbox will still appear on the new page, even if it’s not your website. However, increasingly websites are not allowing cross-domain access, meaning that the wrapped content may not work correctly. You can choose to disable this wrapping behavior by setting this API call to true. Note that by enabling this setting, visitors who click the link to the non-local URL will leave your website and no longer be able to chat with you. As an alternative, you can prepend any link you type into the chatbox with a + symbol (eg. Click here to upload an image: +imgur.com), which will force the link to open in a new tab/window. On your Text & Forms settings page, you can add a target="_blank" attribute to a link to make it open in a new tab/window. Set the group before the chatbox loads. You can get the ID for each group by clicking on it from the Operator settings page. This differs from the setOperatorGroup API call in that it can only be done before the chatbox loads. To set the operator group after the chatbox has loaded, use setOperatorGroup instead. Olark uses polling to check your visitor’s status while on your site. Visitors who leave your site, or have been idle for a long time without changing page, will eventually stop sending polling requests. If you have a single page application where the visitor does not change pages, they may incorrectly be detected as being idle. You can prevent this by setting is_single_page_application to true. The api.box.hide function is useful for when the chatbox has already loaded on a site and you wish to hide it again. For example, when the visitor clicks a particular button. You would use box.start_hidden when you don’t want the chatbox to show at all when the page loads. If you used api.box.hide to hide the chatbox when the page loads, a visitor might see the chatbox appear briefly, before the API call was read. Use this API call to enable the Google Analytics integration on a single page. You can also enable this in your Google Analytics Extension settings. Set the Google Analytics ID for your account on a specific page. For example, you might have separate domains using the same Olark account, but different Google Analytics IDs. Check out our related help guide for this here. You can also view advanced troubleshooting help for Google Analytics + Olark here. Enable the Greeter on a specific page. You can also enable this on the Greeter extension page. If the Greeter function is enabled, you can use this call to enable/disable the advanced notification per page. Set the welcome messages to send to the visitors when the Greeter function activates. If you have more than 1 message enabled in the call, we will choose a random one to send to the visitor when they meet the greeter criteria. Set the time after which the Greeter message will be sent to first-time visitors on your site. Use this call to switch the Greeter on. You can then use the calls below to control how the Greeter behaves. 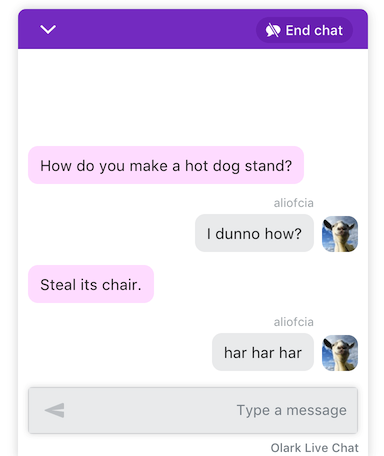 placeholder_text: "I need help with..."
The type property refers to the type of question you would like to ask your visitors and is used in form styling and validation. Options include: - name, - email, - phone, - website, - textarea (good for long response questions) - textfield (good for short response questions). The is_required property will mark a particular question as required or not. Required fields will appear with a * inside the input field. The label property refers to the text above the input field. This field is only necessary to pass for questions where the type is textarea and textfield. The placeholder_text property refers to the grey preview text inside of the input field, to help prompt visitors to fill out the form. This property is only required for textarea and textfield type questions. These questions will be added to your existing prechat survey that you have built on the Text & Forms settings page. Keep in mind you can have a maximum of 6 questions in your prechat survey, any questions that do not fit will not appear. This requires the pre-chat survey to be enabled first. This setting can also be enabled on the pre-chat survey section of the Text & Forms settings page. You can read more about using the pre-chat survey in our Help Center. To add fields dynamically to an offline form, you can use this same format outlined above but use the system.custom_offline_form configure call. Require visitors fill out their email address in the pre-chat survey before chatting. This requires the pre-chat survey to be enabled first. Require visitors fill out their name in the pre-chat survey before chatting. This requires the pre-chat survey to be enabled first. 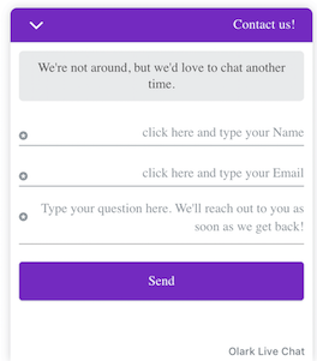 Require visitors fill out their phone number in the pre-chat survey before chatting. This requires the pre-chat survey to be enabled first. Note: You can create Targeted Chat rules without any coding on the Targeted Chat settings page. Be sure to check out the getDetails API call to learn how to access detailed customer information for making creative rules. // Specify a unique ID for this rule. // This helps the API to keep your rules separate from each other. // The condition will be checked whenever there is a relevant change in the chat. // The action will be executed whenever the condition passes. // Limit the number of times this action will trigger using the perPage, perVisit, and perVisitor options. body: "hi, have any questions about our products?" Gets the email address, full name, geolocation, and other details for this visitor. The value will be returned to the specified returnCallback. 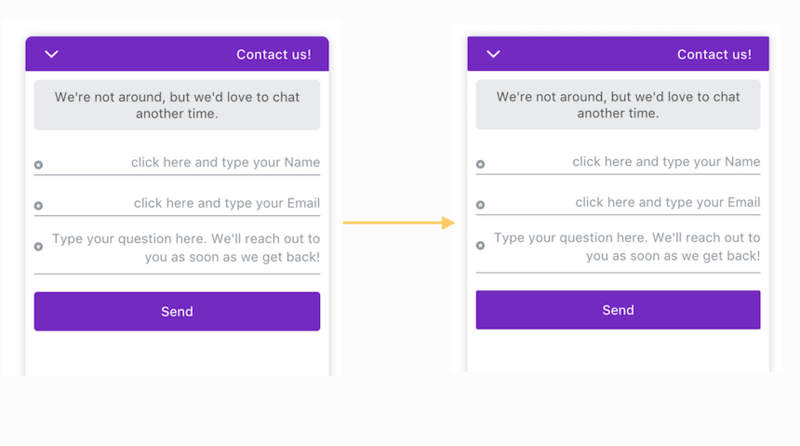 The name, email and phone number fields are the last-known visitor information, either from your pre-chat survey, a completed offline message form, or previously updated via the API. Geolocation information is provided to the best of our knowledge, based on the visitor’s IP. body: "Olark Joe in the house!" body: "this customer might be in San Jose, Costa Rica"
body: "this customer might be in Japan"
the URL from which the visitor began their conversation"
total number of times this visitor has chatted with an operator"
will be true if the visitor is having a conversation right now"
number of messages sent and received for this visitor all-time on your site"
number of messages sent and received during this conversation"
seconds since either the visitor or operator sent a message"
seconds since the visitor sent a message"
seconds since the operator sent a message"
seconds since the operator last received a notification"
If you have custom data that you want to keep track of for a visitor, such as an internal customer ID or some internal data, you can give it to Olark using this API. Note: Custom fields are not sent automatically to CRM integrations. Presently, this is something you would need to email support@olark.com to help set up. Custom fields will however be sent with Webhooks by default. Once set up, Custom fields are sent to the CRM only, they do not appear in the chat console. Keep track of an email address for this visitor, to link it with your CRM cases and display in the visitor list. You can grab information from your registered users and send it to Olark. Keep track of a full name for this visitor, to link it with your CRM cases and display in the buddy list. updateVisitorNickname is best used to display visitor information other than name and email in the buddy list. To display a name and/or email in the buddy list use api.visitor.updateFullName and api.visitor.updateEmailAddress respectively. Add information to the visitor’s nickname in the operator’s buddy list. You can only set a ‘snippet’ of the nickname, since other extensions may be trying to update the nickname at the same time. snippet: "wants to buy a widget"
Keep track of a phone number for this visitor, to link it with your transcripts and display in the visitor list. Add information to the visitor’s status in the operator’s buddy list. You can only set a ‘snippet’ of the status, since other extensions may be trying to update the status at the same time.